On Tuesday, the Houston Astros will head to Los Angeles to play the Dodgers in Game 1 of the 2017 World Series. The Dodgers' path to the World Series was a shock to no one — Los Angeles has won their division title every year since 2013, and have the spending power to compete for the best players. Counter to that, the Houston Astros' World Series run is the result of one of the most impressive rebuilds in MLB history. In the midst of three consecutive seasons from 2011-13 in which the Astros lost 106, 107, and 111 games, respectively, the organization began the Herculean task of turning the worst team in baseball into a contender. 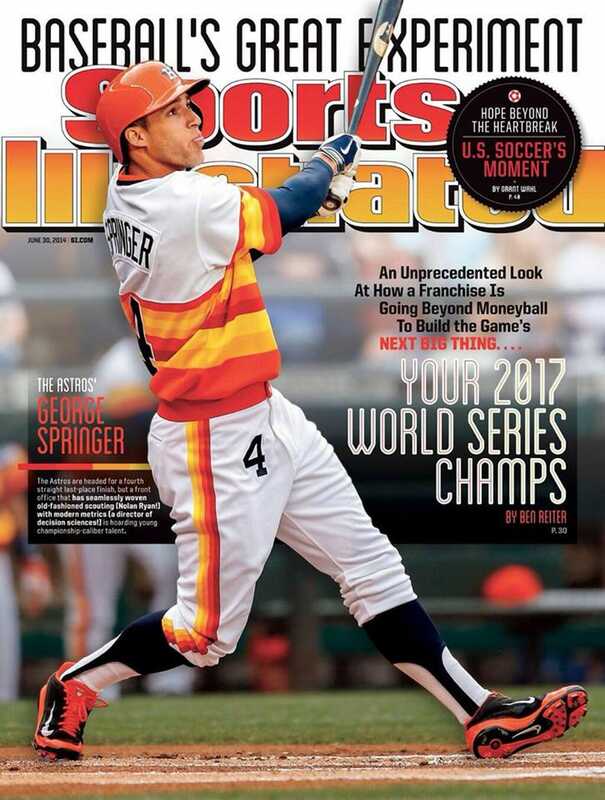 While most would think the postseason a distant dream for those woeful Astros teams, those working in the club believed that success could come much sooner, as did one Sports Illustrated cover story that is now once again making the rounds as its bold prediction comes closer and closer to becoming a reality. The response to SI's gutsy declaration was not extremely positive. 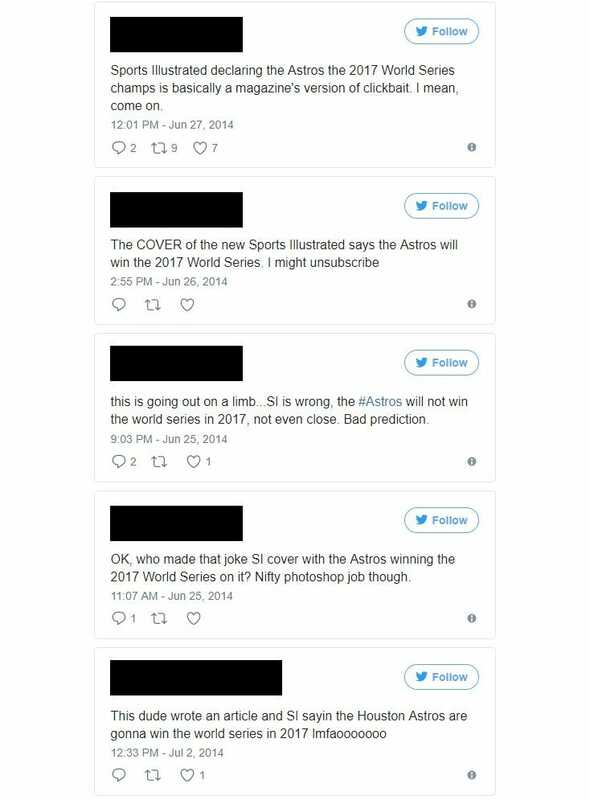 The Houston Chronicle called the cover "more of an attention-grabbing, perhaps even tongue-in-cheek projection than a prediction," and many baseball fans were quick to mock the claim. Ben Reiter's story, "Astro-Matic Baseball: Houston's Grand Experiment," ran as the cover of Sports Illustrated on June 30th, 2014 with the sub-headline, "An Unprecedented Look At How a Franchise Is Going Beyond Moneyball To Build the Game's Next Big Thing... Your 2017 World Series Champs." In the article, Reiter is given impressive access to the Astros' front office, gleaning insight to how a team of coaches, scouts, and stat gurus were working in an effort to turn the franchise around. A common refrain amongst those he spoke with likened the process to playing blackjack. Blackjack is a game of hard numbers, where with each card revealed, there is a certain percentage of available outcomes, and a mathematically correct play for the gambler to make depending on the situation, and sometimes the correct decision doesn't feel great to make. "Hitting a 16 against a dealer's seven, it doesn't feel right," Sig Mejdal, blackjack dealer turned NASA researcher turned Astros director of decision sciences, says in the piece. "With a hundred-dollar bet, it feels even less right. But that doesn't mean it isn't right." Mejdal and his team's goal was to figure out a way to combine hard data (batting average, strikeout/walk ratios) and soft information (a batter's swing, player effort, the likelihood of injury), to create one value that gave the Astros the chance to make as informed a decision as they possibly could when it came to personnel choices. Like hitting on 16 against a dealer's seven, the Astros vowed to make the smart decision, even if it didn't feel right, whether that meant letting go of a fan-favorite player or drafting what had historically been viewed as a risky proposition. Three years later, you can see the results of this overhaul across the Astros roster. But as far-fetched as the idea seemed at the time, the Astros are now on the cusp of history, and those 105-loss seasons probably aren't keeping Houston fans up at night. As Astros general manager Jeff Luhnow put it back in 2014, "When you're in 2017, you don't really care that much about whether you lost 98 or 107 in 2012. You care about how close we are to winning a championship in 2017." Right now, the Astros are four wins away.